What a great show, on every level. 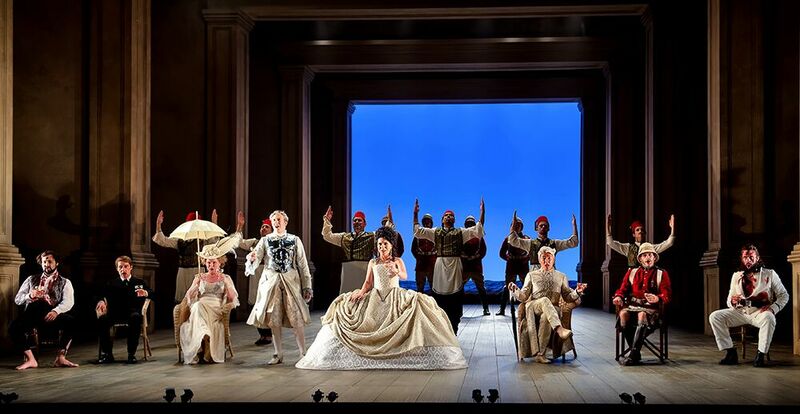 David McVicar’s Glyndebourne production of Handel’s Giulio Cesare, originally staged in 2005, and in its third revival this year, has a cast without a weak link, and never fails to draw in the audience to the work’s cycles of power, suffering, death and intermittent triumph. It brings us deep into the mind and essence of every character. And holds us right there. Every time. The big change from the previous seasons is that the production has a new Cleopatra. The role was originally offered for 2005 to Rosemary Joshua but memorably taken in all three previous showings of the piece, in 2005, 2006 and 2009, by Danielle de Niese. In Joélle Harvey, also an American, it has its new star. She has a fine, agile voice and a compelling stage presence which holds the attention naturally, without anything effortful about it. And she can definitely dance. She also brought deep pathos to her Act 3 aria “Piangerò la sorte mia”, aided by a wonderfully supportive and lyrical flute line from Lisa Beznosiuk. Patricia Bardon (pictured above with Christophe Dumaux) was deeply affecting as Cornelia, one of those roles with far more than its fair share of suffering; Anna Stéphany was vocally superb and dramatically convincing as the revenge-seeking son Sesto, John Moore commanded attention as the out-and-out villain Achilla and Christophe Dumaux cunningly brought out the many sides of the complex character Tolomeo. And in a title role which she has made her own, Sarah Connolly never failed to bring dramatic truth and musicality to every moment. Just one example of the way the combination of fine singing and acting work so well together with the care and the detail in this production was in Cesare’s aria “Aure, deh, per pietà spirate”. The really hard ask in Handel is to sustain a mood – in this instance of pain and sorrow – right through the da capo. All I know is that I shall remember for a very long time quite how touchingly Connolly sang the words “dar conforte al mio dolor”, the sadness of Caesar finding its focus as she contemplated a dead soldier on a battlefield. I also found myself simply mesmerized by the perfect pacing which conductor William Christie now brings to the piece. Back in 2005, unless my memory is playing tricks, he would seek out devil-may-care excitement by occasionally teasing out the ritardando endings, stretching them out like pieces of tantric chewing gum, making life hard for the players from the Orchestra of the Age of Enlightenment – and more or less impossible for the singers. All that has gone. Christie in 2018 is a thoroughly benign force, an enabler; everything just seems so much more natural. He said in an interview five years ago that he would like to be remembered as having “given some people some solace, hope or enjoyment." A resounding yes to all of those. The creative team of director David McVicar, set designer Robert Jones, costume designer Brigitte Reiffenstuel, lighting director Paule Constable and choreographer Andrew George were loudly and rightly cheered for their work as a cohesive team, bringing endless variety and helping the story to be told (the final scene pictured above). This production is Glyndebourne’s best-seller. And it just got better.